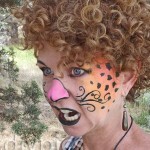 Before you start special effects makeup school, practice with Fauxtex! This is my third year working to perfect a recipe for a homemade alternative to latex, and the results are better than ever! After much tweaking, I found something that is easy to work with, very cheap, extremely non-toxic, fairly quick to set up, and made from ingredients you can get at a grocery store. 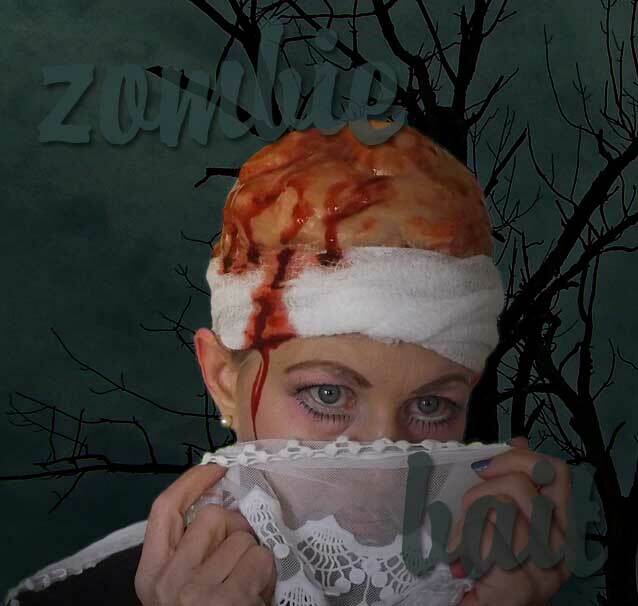 No, it does not behave exactly like the more expensive synthetic latex, but it is a good “starter fx makeup” that you can use to practice before going to film school, for creating wound simulation, or to use for fun anytime. Since tapioca flour has always intrigued me for its rubbery consistency when mixed with a hot liquid, I wanted to use it to give my product a suppleness that not even latex has. Unfortunately, tapioca alone has no “hold.” For structure, I added gelatin (which you will see as the basis for most homemade FX makeups). This combination had both hold and suppleness, but was too tacky, making it a bit tricky to handle with your hands. The addition of coconut oil (which cools to a solid state) gave what I now call FAUXTEX a little bit more manageability without affecting the structure of the FX makeup. It takes about 5 minutes to make a batch of fauxtex, then about 15 minutes until you can begin to use it either directly on your skin or on a sheet of plastic for later use. After 30-40 minutes, fauxtex can be squeezed out of a decorating funel (or sandwich bag) to make shapes such as bumps on skin, scales, or brains. It can also be shaped further after it congeals by using a hot knife as a carving or smoothing tool. Fauxtex is very flexible and comfortable to “wear” and feels more like flesh than latex. Its flexibility allows you to shape it on a flat surface for later use on a 3-dimensional surface. And, again, it is safe to use for anyone who is allergic to latex. Put cold water in a sauce pan and mix in the tapioca flour, gelatin and coconut oil. Stir until the tapioca flour is dissolved (you can add liquid foundation makeup to add the desired skin color if you want). Turn on the heat and stir continuously until the mixture thickens to a pudding consistency. Cook for an additional minute, turn off the heat and let cool. This video shows how to make and use fauxtex (you can switch between English and Portuguese narration). Recipe for Soft Skin: 1 cup cold water, 1/4 cup tapioca flour, 1 packet plain gelatin, 1 tablespoon solid coconut oil. Recipe for Moldable Brains: 1 cup cold water, 1/4 cup tapioca flour, 1 1/2 packets plain gelatin, 1 tablespoon solid coconut oil. Recipe for Ears: 1 cup cold water, 1/4 cup tapioca flour (or corn starch), 2 packets plain gelatin, 1 tablespoon solid coconut oil. The first thing you are probably going to ask is “can I use corn starch instead of tapioca flour for all the recipes?” and I will answer “yes, but you won’t get the same skin-like results.” A recipe with corn starch will set up rigid rather than soft. You may actually want this result sometimes–say, for exposed tendons and ligaments–but I think you will like the tapioca version of fauxtex for most FX makeup jobs. Fauxtex can be applied directly to the skin while it’s still warm, or you can spoon it onto a piece of plastic film, let it set at least 30 minutes, then apply it to your skin. If you are applying a congealed form to your skin, use a bit of left-over fauxtex as adhesive: warm it up for a few seconds in the microwave and rub it on your skin like glue, then apply the fauxtex form onto it. To make shapes, you can either build up the fauxtex a bit at a time, or let cool 20-30 minutes after cooking, put it in a cake decorating funnel and squirt onto a piece of plastic to set. You can also shape it after it’s set with a heated butter knife (for carving or smoothing the surface). One thing that makes fauxtex easier to use than latex is that you can form it onto a flat surface and, after it congeals, it will still conform to a 3D surface such as your face. Variations: You can make a couple variations on the fauxtex recipes above for scars or fake breasts. 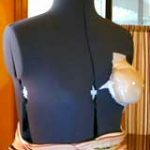 Use the first recipe without the coconut oil for fake scars, and (depending on how perky you want your breasts) use any of the recipes above without the gelatin for false breasts (click on the image for instructions). This research was fun, and I hope you have fun with Fauxtex and save a ton of money with this simple recipe. PLease “like” and share with friends! Can this be used like the liquid latex in layers over tissue/cotton to create the special FX such as bullet holes, pulled/peeling skin? Thanks !! Yes, it sure can! It sets up faster and gives a softer result than expensive latex. Hi! Just wanted to know, is the prosthesis able to be peeled off and reused in the future? Not really. 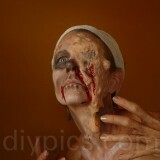 It’s meant as a quick, cheap, non-toxic, one-time use prosthetic makeup. What consistency would I make it if I wanted to substitute this for nose and scar wax? It doesn’t really work like wax. But you can “mould” pieces with the recipe with three packets of gelatin. Check out my prosthetic makeup tutorial here.